Fuente Rosado Gran Reserva Sungrown Magnum R Super 60 is already a classic cigar. 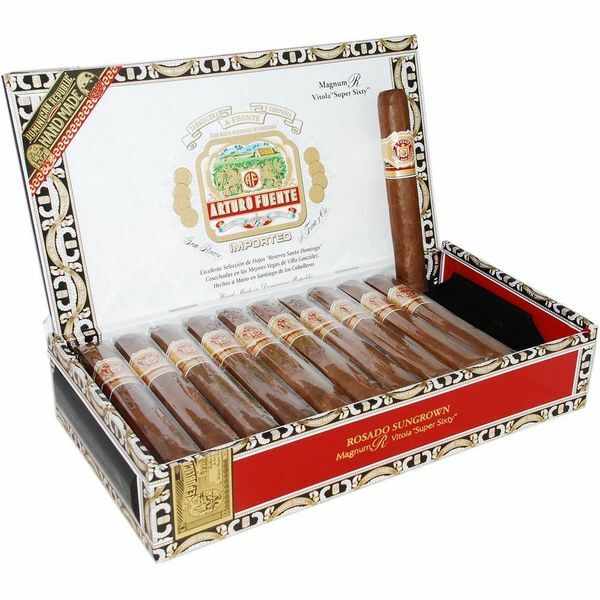 The Fuente premium tobaccos and the rosy wrapper from the Dominican Republic supply a soft, velvety smooth smoke. Slightly sweet on the palate yet with undertones of cedar, leather and and roasted nuts to entice the smoker with a savory side. Pairings with the Rosado Gran Reserva include a softer tawny port, brandy or cognac. Hennessy V.S.O.P. Privilège is a blend of carefully aged cognacs in oak casks. The oak creates a smooth velvety blend of spice, honey and fruit flavors. This will work extremely well with this particular Fuente, just remember to adorn a proper smoking jacket to complete the experience. "A kind of short robe de chambre, of velvet, cashmere, plush, merino or printed flannel, lined with bright colours, ornamented with brandenbourgs, olives or large buttons". The more casual smoking jacket was the preferable evening wear for gentlemen to don after dinner and enjoy their cigar or pipe. Another reason the smoking jacket was popular was the ability to capture the odor of smoke and protect men’s under clothes. In the 20th century the smoking jacket became popular in the 50s and 60s from the likes of Frank Sinatra, Dean Martin, and Cary Grant. Most recently, the late Hugh Hefner was never seen without his smoking robe and pipe. I believe the retro smoking jacket should be reintroduced to the cigar community. Can’t you picture yourself sitting by the fire place with a fine cognac in silk pajamas and a velvety soft robe? Of course you can. This would only increase your enjoyment of your latest online cigar purchase from elcigarshop.com! Cheers!